In my head, Lauren Willig and her books are my best friends. I eat countless meals of fish and chips with Eloise, the modern day character, and drool with all the historical male leads with her. I have a deep affection for all these books, and this one was certainly no exception! This book was on my mind a lot throughout the year of 2010. First, drama on the title format change. The past books had awesome titles like “The Masque of the Black Tulip” and “The Betrayal of the Blood Lily,” but apparently the editors decided they needed to change the format to something more manageable. A lot of readers (including me) protested this one…and lost. Then – they changed the format for the cover art too. They wanted to replace the beautiful portrait covers with the stereotypical romance novel cover. Oh no they didn’t. Readers protested this one too…and won (partly). They stuck with a more portraity look, but used a live model. Compromise. Okay, first off…to get the one thing I want to say that isn’t positive out of the way. The modern day Eloise/Colin parts of this story are basically throwaway. Nothing really important happens and their relationship doesn’t really make any progress. The only thing of note that happened was really just all set-up for what will happen with them in the next book. But…even though it was pointless, I still loved reading about them. I just anticipate reading more of them so much that I was disappointed this time around. However, I was thrilled with the majority of the book. I feel like this one is quite a bit different from the rest of the series because we didn’t get a lot of build-up/background with Laura in the previous books. Most of the other heroines have small to moderate parts in the series before they get their starring role. I believe Laura shows up briefly in the second book (correct me if I’m wrong here), but nothing of note. So…we meet her character for basically the first time here. Not a bad thing, just different. I enjoyed getting to know her with no previous knowledge. I loved both Laura and Andre, and learning more about them as they learned about each other. I also loved Andre’s kids and the way they brought out Laura’s personality. The circumstances they find themselves in are pretty dangerous and high-stress (trying to avoid spoilers here! ), so we get to know this family pretty intimately. Lauren really is an incredible writer. She is brilliant in every aspect of her writing: characterization, plot, historical detail, humor, suspense…it is all there and it all shines. Seriously you guys, if you like romance and/or historical fiction and you haven’t tried this series…you have no idea what you’re missing. This series is the best of the best! 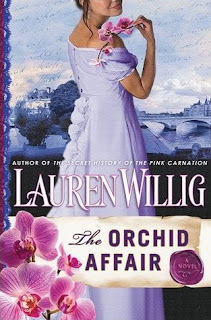 Orchid Affair will be released in just a couple of days, head to the bookstore on the 20th to pick up a copy! I have the first book in this series and it is on my list for Historical Fiction 🙂 Really looking forward too it! I love this series! I can't wait to read The Orchid Affair. I have to admit that I enjoy the historical parts of the books more than the contemporary parts, at least in all the recent books. At first I liked reading about Eloise and Colin and then I got impatient and just wanted the historical parts. I was happy that they were absent from The Mischief of the Mistletoe. I am glad that this one takes us back to the regular suspenseful spy stories. Great review! Thanks for sharing your thoughts on it.